Randall Wallace broke into entertainment writing with episodes of TV’s Starman, Hunter, and Stingray in the mid-’80s, but he didn’t direct his first film, The Man In The Iron Mask (the star-studded one with Gabriel Byrne as D’Artagnan) until 1998. And he’s only directed two movies since then. But he’s worked steadily in splashy, high-profile historical films, writing the scripts to Braveheart (which earned him an Oscar nomination) and Pearl Harbor, co-writing and directing the 2002 Mel Gibson Vietnam movie We Were Soldiers, and now directing Secretariat, a Disney-produced movie about the record-breaking racehorse and his owner, Penny Chenery (played by Diane Lane), a woman who broke into the boys’ club of horse breeding and racing in the early ’70s and capably proved herself to the doubters. The A.V. Club recently sat down with the affable, scholarly Wallace to discuss his philosophy on historical movies, Secretariat’s spirituality, and why teaching a duck to play drums helped him make this film. The A.V. Club: There’s an old show-business saying: “Never work with children or animals.” Did that come to mind at any point when you were making this film? Randall Wallace: I started my career after majoring in religion and minoring in Russian at Duke, and during a year in the seminary, my first job was manager of animal shows at Opryland USA. It was a theme park, then. Now, it’s like a shopping center, but then, it was a theme park. I was director of an animal show where barnyard animals played musical instruments—no kidding. I had a pig that played piano, and I named him Piggeracci. I put a little red bow tie on him. A duck that played the drum, and I named him Burt Bachquack. Eight thousand people a day watched the show, and that was my first experience out of studying theology—it was called the Barnyard Animal Opry. AVC: How did you wind up in that job? RW: I wanted to be a singer-songwriter, and I had started a record company when I was in college. My parents had sacrificed a lot for me to go to school. I mean, they saved their money, they did without things their whole lives, so my sister and I could go to college. They wanted us to be professionals, and I wanted to be a songwriter, which was the worst profession—it was like, right next to saying I wanted to be a pimp, for them. I started a record company when I was in college, and I didn’t know where to go and what to do. I met Kris Kristofferson. He was a Rhodes Scholar, he had been an Airborne Ranger in the military. So he was the kind of guy I sort of related to. He said, “You gotta go to Nashville. You gotta pursue your career.” So I went to Nashville, and just to feed myself, I auditioned at this park, and they offered me that job. AVC: So, how do you train a duck to play the drums? AVC: So you have experience with animals to the point where it wasn’t ever an issue on this movie? RW: No. I wasn’t afraid of them. I wasn’t afraid of the physical danger, and I felt that animals would bring… They have a fascination for any audience, particularly the fact that they are sort of primal beasts, and they don’t do what we tell them to do. That makes them magnetic. We’re much more fascinated… I mean, some of the most effective scenes in Secretariat are when Diane is staring into the eyes of the horse. There’s no dialogue at all. I believe that strikes the audience as authentic, which is an essential piece of any story having a real impact on somebody’s heart. AVC: There are several moments in the movie where she seems to know what Secretariat is thinking. At one point, she actually looks into his eyes and literally seems to mentally speak with him. Do you believe animals communicate that way? RW: Frankly, no I don’t believe that there is a kind of subliminal direct line of communication between humans and animals that way. But that wasn’t really what I wanted the scene to reflect. Certainly one could draw that from the scene, but what I felt was the real truth of that is that Penny was trying to come to a decision that her intellect alone could not lead her to. The experts around her were giving her guesses. Lucien, her trainer, comes up and says “I don’t know if we should run him.” He’s not saying “We should not.” This all tied in for me with the fact that Penny’s standing up not against her enemies, to whom she stands up as well, but she is standing up to the people who are supposed to have her back—her husband, her brother. The people that love her most are the ones who are not there for her. She’s trying to find, “What the truth for me?” The horse is a fierce, irrational, primordial thing, and she’s looking for the answer. It is not so much that she is looking for the answer in the horse. She’s looking for the answer in herself. When she’s looking at the horse, she’s finding herself most in touch with who she is. That’s the way I saw it. AVC: The movie doesn’t go deeply into her relationship with her husband. It suggests his disappointment and confusion at the conflict between what he expected from a wife, and what his was doing. But the disagreement is backgrounded, and he comes up as mildly supportive in the end. Was there a more complicated relationship there? Was there a reason you didn’t want to go deeper into that? RW: Everything we told was true, but we did not make that the focus of our story. I don’t want to get away from the question, but I’ll point out one other instance of how it was. Penny had also owned another horse that had done really well before Secretariat, nowhere near as well as Secretariat, a horse called Riva Ridge, and he won the Kentucky Derby before. But Penny’s journey was all the same. I just chose to focus on the events of Secretariat. In terms of her marriage, I believe all of those moments were accurate. Ultimately, she and her husband—their marriage fell apart. But to delve into all of that would be to make that story deserve a lot more, to fairly treat the subject of divorce. You would need to spend significant time on just what the nuances were of that relationship. I thought that would distract us from the greater story, which was what happens with the career of Secretariat. But I felt that the husband, the arc of her husband, was accurate. One of my favorite scenes is when the family’s watching a race, and he sees unmistakably the impact that Penny’s choice is—the positive impact she’s having on their children, particularly the girls. I believe that’s fair, but I thought there were certain things, like the ultimate collapse of their marriage, the presence of Riva Ridge in Penny’s life, or even as we were looking at the epilogue of the story, to bring up that Secretariat died of laminitis. I wanted the audience to come out of the movie with an unalloyed sense of the efficacy of faith and love. All my other movies have been about it, but they ended up with somebody beheaded or shot through the heart. This was my first chance to say, you could bring… a boyfriend and girlfriend could watch this movie with equal passion, and they could bring their parents, and they could bring children, and everybody would have a primary experience. That’s why I focused the way I did. 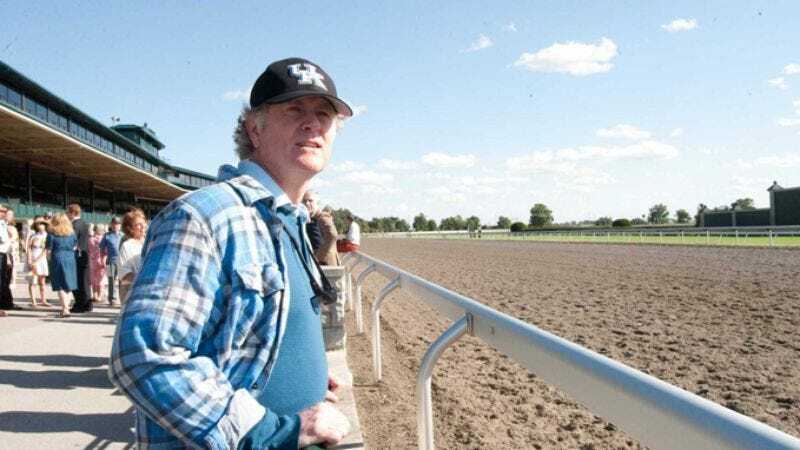 AVC: There’s a religious touch to the movie: the biblical quote that frames the film, and the way you foreground the gospel music when Secretariat is winning. It suggests very strongly that there is something religious about the characters’ experience. Did you feel that way? RW: I did, but I want to make a point about how I would use the word “religious.” I believe that Secretariat did something we would all call transcendent. He achieved something no one thought was remotely possible. No racehorse had ever done anything like it before, nor has any racehorse done it since. It wasn’t simply the physical capacity, but it was the willingness to commit to that in order to achieve it. If he hadn’t gone out as fast as he did, if he hadn’t gone out at a pace that was thought to be impossible, he would have never run that time. He would have never reached his capacity. In fact, he was accelerating at the finish line of the Belmont. He was accelerating. I found that was transcendent, but here’s a part that I think is crucial, at least for me to know. I am fascinated with the study of the way belief affects who we are and what we can achieve. And the way doctrines and dogma destroy the very things that belief is exerted to create: community, love, acceptance. I love that discussion, but I am absolutely convinced that all of my dogma is nonsense. C.S. Lewis said whoever gets to heaven—and he didn’t believe he would go—whoever gets to heaven is going to be surprised. I think that’s a beautiful statement and a beautiful belief, that life is a mystery and that we don’t have it figured out. That doesn’t mean we have to live in cynicism, that it is audacious to have hope. But when we say “religious,” the spiritual theme I wanted the movie to have was just to say that courage matters, and hope prevails, and love works. And I wrestled a lot with whether to use “Oh Happy Day,” because it is certainly related to a kind of Southern gospel culture. However, that song more than any other I know transcends that kind of thing. It is a more connective song, and it celebrates joy like no other song I know. So that’s why I had it. I have a friend at the studio who’s Jewish, and I had asked her in particular to pay attention to the music. I didn’t want to load the question. She sat next to me at one of the test screenings, and at the climax, I looked over, and she was bawling. She said, “You know, I’m Jewish, and I want them to sing ‘Oh Happy Day’ at my funeral.” I thought, “Okay.” I think it was a good choice—I hope it was. AVC: From your laughing, I guess you’ve been asked about this a lot. RW: Well, it scares the crap out of academics, that statement. It really troubles them. RW: I think that it implies historical irresponsibility. AVC: What does that saying mean to you, particularly in this film? RW: I think that a movie is impressionistic. You have two hours to capture the fullness of a story. Even the fact that we talk in narrative as opposed to in philosophical, or strictly intellectual terms, is a different way of getting at the truth. When you make that narrative flow together, you sometimes have to synthesize. You have to distill. An example would be… Penny’s daughter, Kate, was utterly rebellious, was totally a flower child, totally into, by her own admission, every form of empowerment and rebellion. That was Kate, and that is Kate to this day. A fascinating woman. But she didn’t do a play in which she sang “Silent Night” in the middle of the summer in a war protest [as she does in the film]. But she would have had she thought of it. So Penny wasn’t in a hotel room [crying because she’s missing Kate’s performance] in the way I created that scene, but that scene to me gives the essence of the truth of what Penny felt. It’s a narrative way of capturing what was in fact a broader and less focused sense. To me, it’s a true sense of what they did. AVC: Is this philosophy something you’ve developed over time while working with historical stories like Braveheart, Pearl Harbor, and We Were Soldiers? Or did it you have it when working on those films? RW: Well, I’ll tell you, a lot of this came because I got attacked so much about Braveheart. No less than Winston Churchill wrote about William Wallace in his A History Of The English-Speaking Peoples, that the facts of William Wallace’s life are so shrouded in legend that they’re almost unknowable. All that you can say is that for centuries, his stories inspired his people. Well, no one knows what William Wallace said on the battlefield. I loved that. That meant I got to write what would have made me inspired by him, I hoped. But I had a lot of writers, particularly those from England, come at me over that. One of them called me and said, “What do you consider your responsibilities as a historian?” I said, “I don’t have any. I’m a dramatist.” He said, “Yes, but you’ve distorted the facts of history.” I said, “Well, no. Romeo And Juliet has nothing to do with Italy, and Hamlet nothing to do with Denmark. Maybe we should picket the Royal Shakespeare.” The guy said, “Well, you’ve made it seem as if the current British royal family are direct descendents of William Wallace,” because of that piece when he gets the princess pregnant. I said, “I want to apologize publicly, because it was never my intention to defame the memory of William Wallace.” [Laughs.] And the guy got really huffy, and I say, “Dude, lighten up.” The essence of it goes way beyond Scottish history. I wasn’t trying to tell that. I was trying to tell anybody anywhere that there is a point in your life when you have to say, “I’m not trying to run a popularity contest. I’m running a life here. I would love it if you would approve of me, but even if you don’t, I have to be who I am.” And I thought that’s what Secretariat was about. AVC: At the same time, there are so many films that capture the essence of this movie, or a story like Braveheart. The rise-and-fall hero story, the underdog sports story, and so forth. If the actual historical details aren’t important, then why frame it in terms of historical story rather than writing an original story? RW: Well, I would write an original story, and I have, and do. The thing with this is that I didn’t use any invention for this, except in what I would refer to as synthesis and focusing. People have lived this story. This is a scrupulously accurate story. The races have… the gaps between the horses are absolutely precise. I didn’t want people saying “This is a Hollywood ending.” No—he really beat these other horses by 31 lengths. Not only that, all of the other crucial details of the story are accurate. So what I used the synthesis for was to try to understand the private life of someone who might herself have difficulty articulating what the truth was. A better example is, I asked Penny how she liked the movie after she saw it. She loved the movie. She said, “I didn’t realize until I saw the movie how isolated I had been, how difficult and alone a journey this was.” She said, “The other owners, they respected me, but they didn’t accept me. They didn’t welcome me. And I spent a lot of afternoons alone in my box at the racetrack.” She had experienced that without being conscious of it, because to stop and be conscious of it would have been to weaken herself, would have been to undercut what she had to go do. I mean, obviously, I talk about this woman with great reverence. If you meet her, you can’t help but feel the charisma she still has in her mid-80s. That woman’s spectacular. AVC: There are some precise historical touches in the film, like getting the distances between the horses right, or using the real Triple Crown trophy as a prop. Why are details like that particularly important, where details of exactly what someone said or did isn’t? RW: I don’t think it’s less important. I think it’s all equally crucial. It’s just, what technique do you have to do to get at the truth? I’ll use a different example. There may be ten thousand facts that any of us know about our own lives, but if we were going to choose, in a limited amount of time, to try to convey to someone we loved deeply—like to pass along to a child the essence of our story—we would have to select which facts to tell. And that, I think, is one of the great discussions of all of art. You got the Romantics, who only want to tell the beautiful side. And then you got the Realists, who actually focus on the awful and the gutter. Then you got the warts-and-all. So I’m trying to say, how can I convey to you the music of the private moments? We’re watching a story in which music comes up in the background, and some of the loudest noises in Secretariat are silences. So it’s a two-hour impressionistic story of a life. But when there are people still alive who have lived this, and horse people who are watching the story, to say “Do you buy that this is true or not?” is… But more than that, I think even children know when they’re in the presence of a story that’s authentic and has a certain reverence for its subject, and a reverence for its audience. And I hope that that reverence for both comes through in this. We didn’t violate any literal facts of history. All the literal facts of the history are accurate. Ernest Hemingway said “No S.O.B. should think that anything is important just because it happened to him.” And I think it was G.K. Chesterton who said “The way to be a bore is to tell everything.” And that’s really the point that I’m trying to make. If you can’t tell everything, as a filmmaker sometimes you have to formulate one scene or one image that represents all sorts of other detail and tells it in a compelling way, and a way that actually captures the power. Because the power… you don’t know something just because you could cite statistics of it. “Who was your father?” “Well, he was born in 1922.” “No, but who was your father?” And that’s the difference for me. AVC: Have you ever, even as an idle exercise, thought about what a movie of your life would look like? What those key communicative facts would be, and how you’d put it together? RW: Yeah, that’s a scary thought, and it’s really remarkable. This is actually my second film in a row which was set around this time, within a 10-year span, and in which the principal figures are still alive, and view the stories with a certain reverence bordering on the sacred. I think the challenge… I can tell you in a direct personal way about that. Both of my grandfathers were dead before I was born. My father’s father was dead before my father was born—my grandmother was a widow before she was a mother. I was desperate my whole life to know who these men were, and my father once sat down with me and told me a story about one of my grandfathers that made me know everything I needed to know about him, and who I was supposed to be because of him. It was a single story, took two minutes to tell. And that’s the alchemy of storytelling. I think that’s the power of narrative, of a tribe sitting around a campfire, and the sage or the clown says, “Here’s a story.” And that story molds their identity as a people. Movies are just our form of that campfire.